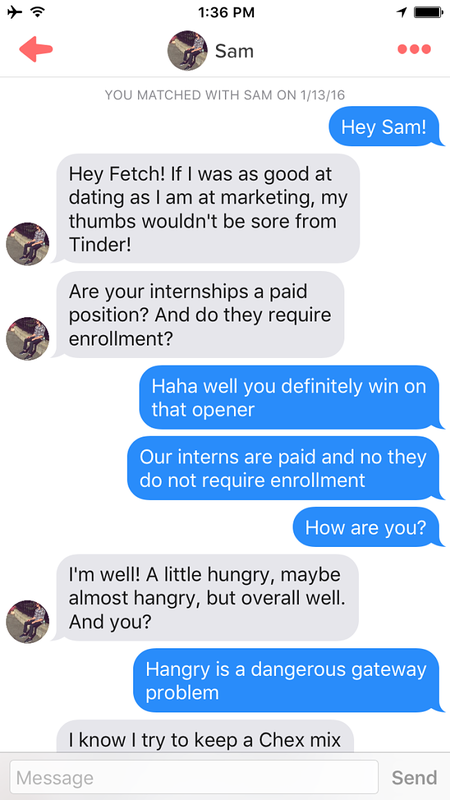 If you want to hire interns to work at a mobile agency, you need to find them in apps where they spend a lot of time – like Tinder. Earlier this year, Dentsu-owned Fetch’s New York office set up a Tinder profile to find potential interns within the app’s roughly 50 million users who skew between the ages of 18 to 34. 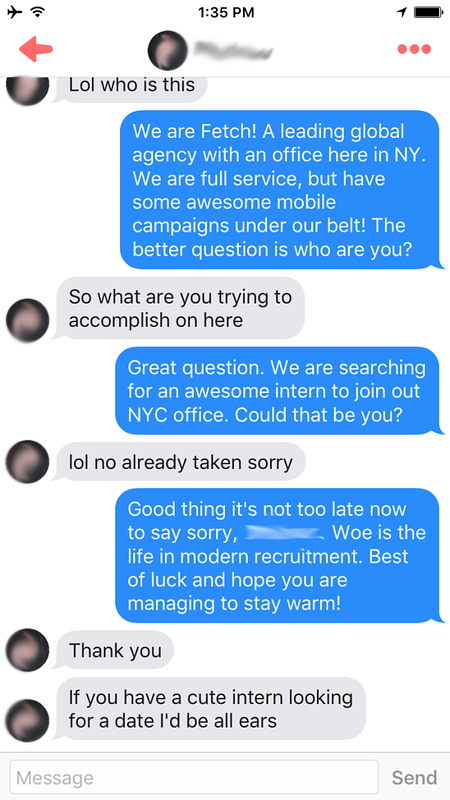 For one day in January, Fetch turned on the profile to match with people in the New York area, asking them to send their best pick-up line, which resulted in more than a few funny one-on-one conversations with folks who clearly didn’t read through the agency’s profile before swiping right. The respondent above didn’t work out, but the agency did find Sam Weidt, a 22-year-old who is helping the shop with video editing, campaign tracking, copywriting and social media. Fetch is now considering a second Tinder-based campaign to find other interns. So, what was Weidt’s pick-up move? In total, Fetch matched with 270 potential applicants “150 men and 120 women” in January, and the agency spent three weeks talking to them before whittling the competition down to five in-person interviews. “Men were definitely more engaged in using the app and conversing whereas females tended to be more reluctant to match or chat as much,” an agency rep said. 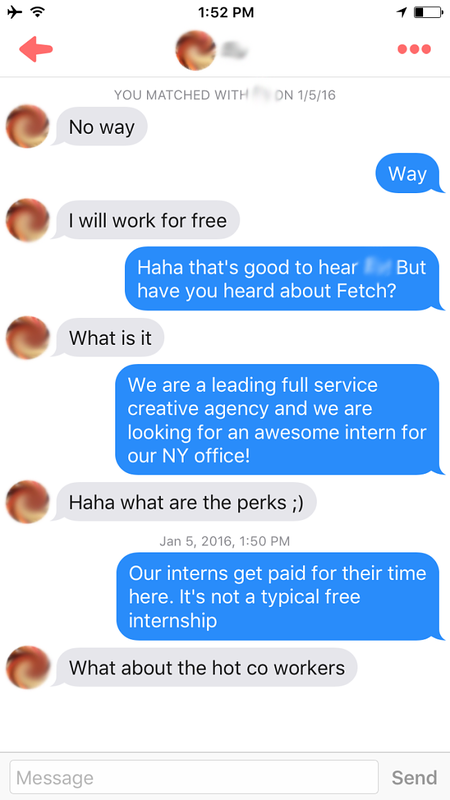 Fetch isn’t the first agency to find interns through Tinder. Last year, Havas Chicago set up a profile on the dating app as part of a recruitment program that also included Instagram. And a number of agencies are recruiting through red-hot millennial app Snapchat. 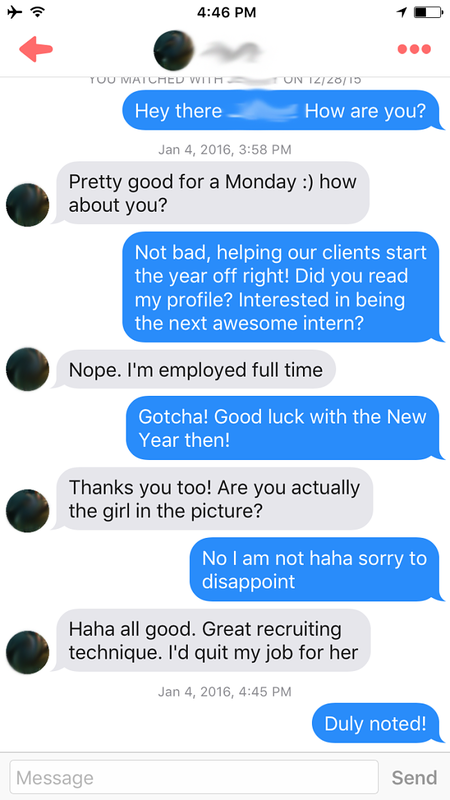 Check out some of Fetch’s best Tinder conversations that it shared with Adweek below. This article was first published in Adweek on April 6th 2016Â and was written by Lauren Johnson.